In spring, damp grasslands and moist pastures are transformed by our beloved Meadow Buttercups as they hold their shiny yellow flowers up to the sun. Flowering from April to October, these perennial wildflowers are distinguished from our other native Buttercups by their flowers being somewhat smaller (15-25mm across) and by their leaves. They are pinnately divided leaves, cut into between 3 and 7 lobes, with the central lobe having no separate stalk. 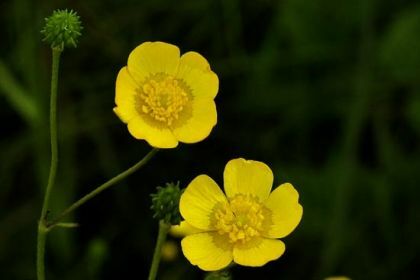 Also the sepals of this Buttercup are upright, unlike those of the Bulbous Buttercup which turn down. This native plant is poisonous and belongs to the family Ranunculaceae. Impossible to say where or when I first became aware of Buttercups .. they were always there. 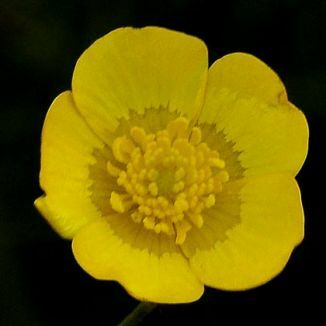 However, the first record I have of identifying this particular Buttercup from the other two whom it resembles (Creeping and Bulbous) is from Pollardstown Fen, Co Kildare in 2007 when I also photographed it. From the National Folklore Collection, University College Dublin. NFC S 468:266. From Co Kerry.